Researchers from Harvard Medical School and Massachusetts General Hospital recently completed a preliminary study into the impact of cryopreservation on the gestational size and preeclampsia risk in patients at risk for elevated peak serum estradiol and ovarian hyperstimulation. The researchers believed cryopreservation would reduce the risk of preeclampsia and small for gestational age births. 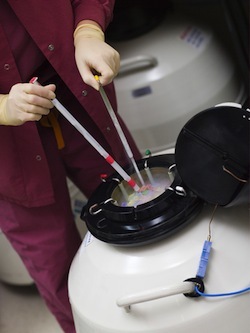 The cohort study involved 20 participants who volunteered for cryopreservation of all embryos. The embryos were subsequently thawed and used for embryo transfer. The control group consisted of 32 women who chose fresh embryo transfer in place of cryopreservation and cryo-thaw. The rate of preeclampsia and small for gestational age births were lower in the cryopreservation group. Several factors, including peak serum estradiol level and body mass index, were taken into consideration but did not change the clinical significance between the two groups. Of all the women in the study, only seven experienced preeclampsia and all were part of the fresh embryo transfer group. The study findings, thus far, reinforce the hypothesis that cryopreservation and cryo-thaw before embryo transfer significantly reduce the possibility of preeclampsia and small for gestational age birth. Source: Imudia AN, Awonuga AO, Kaimal AJ, Wright DL, Styer AK, Toth TL. Elective cryopreservation of all embryos with subsequent cryo-thaw embryo transfer in patients at risk for ovarian hyperstimulation syndrome reduces the risk of adverse obstetric outcomes: a preliminary study. Fertil Steril. 2012 Sep 28. pii: S0015-0282(12)02188-7. doi: 10.1016/j.fertnstert.2012.08.060.